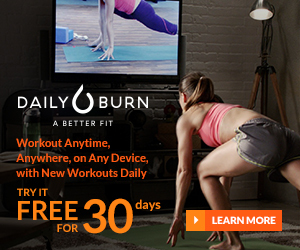 Daily Burn vs Beachbody on Demand: Which Fitness Program Should you Choose? You are here: Home / Reviews / Daily Burn vs Beachbody On Demand: What They Won’t Tell You! Instead of purchasing DVD versions of single workout series like P90X or Insanity, you can now stream these programs straight to your computer or smart TV instantly. There are many options when it comes to On Demand home workout programs, but the two most popular are Daily Burn vs Beachbody On Demand. Both of these programs allow you to choose from over 400 videos for killer at home workouts. Both have apps that allow you to access videos and content. Both can also be viewed from any number of smart TVs or consoles, like Apple TV, XBox One, Roku, or Amazon Fire TV. The only thing you need is an internet connection and something to watch the videos on and you’re good to go! Below, we dive into both of these on demand programs and find out which one is the best value for you. Daily Burn begins with a quick questionnaire that asks you about your goals and current fitness level, and recommends a program for you. This program uses that same trainer (for the most part) and ensures you get a tailored workout that aligns with what you want to accomplish (weight loss, toning, building muscle, etc.). You are free to follow the program, or switch between any of their 600+ videos. The cost for Daily Burn On Demand is $14.95 per month, and you can get a free 30 day trial to try it out before you buy (and 10% off your next three months). First, we’ll start with the pros. Daily Burn does a great job at matching your goals to a specific trainer and program. There is a wider array of programs that range in both program length, as well as length of each workout. What’s great is that you can browse through all of their programs, and they are all very different. Each program shows has a quick and easy breakdown of goals (weight loss, strength, mobility, flexibility, etc. ), as well as difficulty level, duration, and workout length. Programs can last anywhere from one week to three months, and workouts can be as short as ten minutes. All workouts can be done in less than an hour. The workouts also have a good mix in terms of the workouts themselves. There is weighted strength training, yoga, dance workouts, heart rate training, and lots more. Daily Burn also provides pretty decent nutrition plans and recipes on their site. They have a great online customer service that is responsive and is generally well received by anyone writing in with issues or questions. Most of the cons we’ve seen have dealt with concerns over payments or refunds. Some users have said that they’ve had issues when trying to cancel their membership and still being charged afterward. This is not true for all users, so we have to take each complaint with a grain of salt. Other issues we’ve found are that, despite the large number of videos and programs, each program tends to have fewer workouts than do the Beachbody programs. This might make some programs feel dull when you are doing the same workout and getting the same encouragement each week. Beachbody’s user experience is top notch from beginning to end. The forums tend to be more active than do the Daily Burn forums, and the community is more engaged in the workouts and discussion boards. As we mentioned earlier, despite fewer videos in the whole program, there is more variety when you’re within a specific program. There is enough variety between all the series like P90X3, Max 30 or Insanity. Pricewise, you are getting a little better deal with Beachbody. When you commit to those six and 12 month packages, you really begin to see cost savings. There is also more workouts that don’t require additional equipment (though some like P90X2 do require some weights). Some Daily Burn programs ask you to have free weights, resistance bands, and even plyo boxes. While you don’t get the full slate of Beachbody videos, you do have access to some sample programs to see if it is something that you’d want to pay for and add to your library. There are also fun “Challenge Du Jours” every month, which combine different aspects of multiple programs that are available to base level users. What we don’t love about Beachbody On Demand is the fact that you have to do the research for yourself in terms of what program would be better suited for your fitness goals. We also don’t love the fact that some of the Beachbody programs are only available through a premium subscription. While there is enough variety with what is offered at the base level, it’d be nice if everything was available, even if that meant a few extra dollars per month. While both programs have their strengths, Beachbody On Demand has better programs, better trainers, and with the videos usually lasting 30-60 minutes, you end up getting a better workout. We love Daily Burn for those who don’t have an hour to dedicate to their fitness, but sometimes only getting a 15 minute workout will have you looking for a second or third workout. Additionally, if you signup for a year’s worth of Beachbody On Demand, you are almost cutting the price in half of what you’d pay for Daily Burn. Both Daily Burn vs Beachbody On Demand have great qualities and since they both offer 30 day free trials, it wouldn’t be a bad thing to try each of them out to see which works better for you. From our experience, however, we prefer the consistency and top-tier workouts Beachbody On Demand has to offer. Thanks for the great advice. I haven’t worked out for years, so after reading your review I agree that Beachbody on Demand seems to be the superior program, I think as a beginner I’m going to go with Daily Burn and see how it goes! If you are looking for a Daily Burn coupon, I’m pleased to say that I’m able to offer my readers 10% off their first three months (this is AFTER the 30 Day Free trial). Just use my link to sign up.